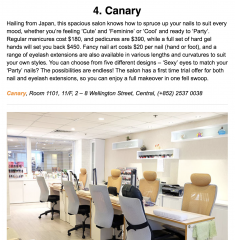 Canary is a Japanese nail & eyelash salon located in Central, near by Lan Kwai Fong. Enjoy great service and make yourself relaxed in our spacious salon. We welcome new customer not satisfied with other salon, and of course whom　never try nail and eyelash extension. We are extremely happy to discuss about your nail and eyelash condition, and the design which makes you more attractive. We have a first time trial offer for nail and eyelash extensions both. 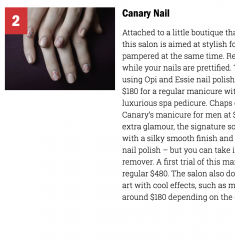 To know more about our salon, please read the review about Canary Nail by Sassy Hong Kong !